So here is Ms Tagalong in the Czech Republic wanting snow, not finding much, but enough to cover anything resembling a community garden or even a garden. Vegetables are not the Czech's strongpoint, especially here in Bozi Dar on the remote reaches of Bohemia about 400m from the German border. Sauerkraut and some grilled veg appear if you ask for them but there is no lack of Huhnchen even if it is only on the menu! Walking into Oberwiesenthal the other day, crossing the border with no guards in sight Ms Tagalong, Mr Ideasman and crew made it into the little ski town and sauntered into a few Christmas shops laden with wooden Christmas ornaments. Trees, snowmen, horses, choristers, wooden chalets, musicians, but sadly no chickens. Another outing to Karlovy Vary, aka Karlsbad, found the female members of the crew oohing and aahing at some of the Bohemian glass and of course you will be delighted to know that they spotted some wonderful chickens. 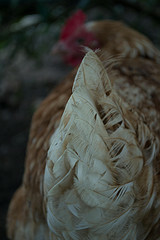 Happy New Year - Chickens of 2012! So Ms Tagalong comes to the end of the year and looks back at all those wonderful chickens she has seen all over the world. 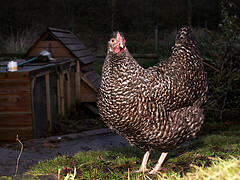 She was lucky to have a friend who sent some beautiful winter chicken photos who feature as Ms January and Ms December. The others were snapped throughout the year. So that was the year in chickens and they all wish you a Happy New Year!